Whitening, Stain Removing, Deep Cleaning and Conditioning. one gallon makes up to 33 gallons. 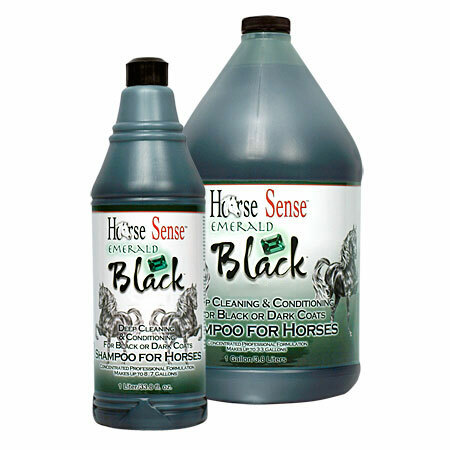 EMERALD BLACK® professional shampoo gently, thoroughly and deeply cleans conditions and enriches the color of black or dark coated animals. Helps eliminate red tones, brassiness and sun-fading. Deodorizes and leaves hair lustrous, manageable and shiny. Improves health by unclogging pores and restoring the skin’s vitality. Extreme concentration creates great value! Long-lasting results with animals looking, feeling and smelling great long after Emerald Black® is used. Humectant and emollient rich formula is easy on your hands and enriches the animal’s skin. May safely be used regularly for beautiful, show ring results. Also great for dogs, cats and most other animals. EXTREME CONCENTRATION of 32 to 1.